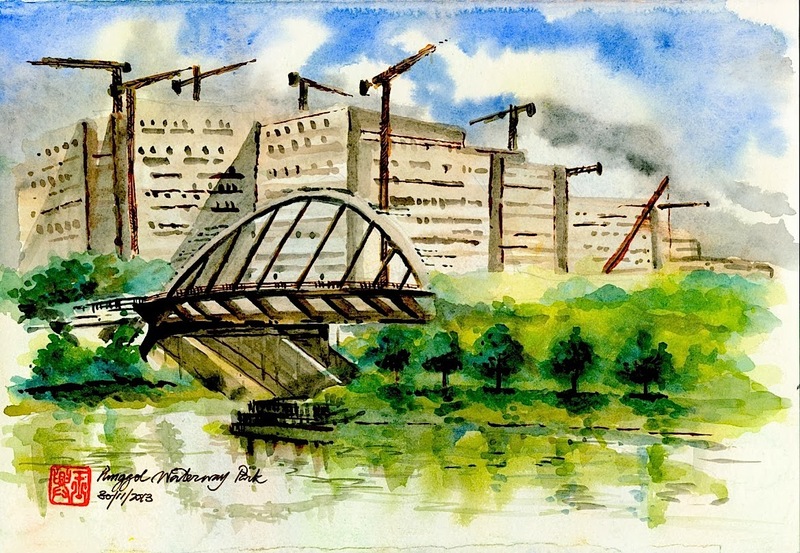 Musings of a Citi Sketcha: Sketchwalk at Punggol Waterway Park. Sketchwalk at Punggol Waterway Park. The Urban Sketchers decided on Punggol Waterway Park as the venue to hold November's sketchwalk. As it turns out, it's the hottest Saturday on the month and the fact that the park is a young one with hardly any mature trees for shelter was no salve. Punggol was once a fishing village littered with pig and poultry farms set alongside vegetable plantations. Today, its new residential town is set to capitalise on what remains of this lovely setting. The waterway traversing the town centre and the coastal promenade are pleasant additions to the breezy open spacesand seafood restaurants. The Town Park is a multi-purpose park located just a few minutes' walk north of the Punggol Town Centre. Its traffic-free environment makes it an ideal venue for plenty of leisure and recreational activities along the Punggol Waterway. One can also embark on a nostalgic walk to the old Punggol Road. The Punggol Waterway Park and My Waterway @ Punggol are joint agency projects between HDB and NParks. The project is part of HDB's 'emaking Our Heartland' initiatives to turn Punggol Town into a 'Waterfront Town' of the 21st century. The Waterway runs through the Punggol Waterway Park, and both serve to increase park and water frontage for the housing estate and provide a green respite for residents. Designed with four themes to cater to residents of all ages, the park also provides residents opportunities for leisure activities such as jogging and cycling which can be carried out along the promenade at both sides of the waterway.